I’m waiting for the day we can pseudo-restand like Sunshine Vert or Blaus. Until then, this has gotten too slow. For the most part, Break Rides have fallen out of favor. 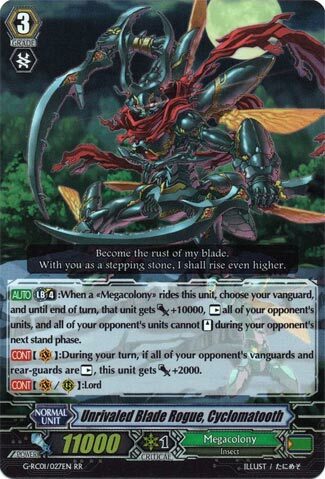 Cyclomatooth is still one of the stronger ones with his ability to stun the Vanguard but even still, you won’t see him run in many serious Megacolony decks, whether that be Machining or Gredora. Break Rides just tend to be too slow in a world where most players want to be Striding every turn. Next Time: You thought Obtirandus was the only expensive GR bug? Previous article12″ Macbook: The Future of Laptops?